The Robin Jung/ Rob Levit Folk Jazz Fusion, aka FJF, was founded two years ago during a casual Indian dinner with friends. Dr. Robin Jung, top biologist and frog expert with the USGS, broached the topic of musical collaboration with guitarist and composer Rob Levit. The next day they got together to jam and before long were cranking out memorable tunes combining their love of folk, jazz, world, and classical idioms. Robin has long been a fixture as a back-up singer in several of the Annapolis area's most popular bands but it took Rob to realize that her crystal clear, introspective, soulful voice should be upfront surrounded by subtle accompaniment. 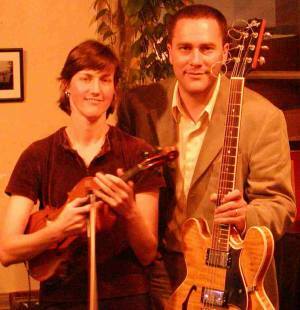 Within a few months, the FJF was up and running, performing both as a duo and as a quartet with bassists Mark Shatz (now with Nickel Creek) or Max Murray, and drummer Frank Russo. Since the inception of the FJF, they have performed monthly at 49 WEST in Annapolis to a packed house, obtained bookings at Blues Alley, Tawes Garden, Andy's in Chestertown, and the 333 Coffeehouse. They are thrilled to have the opportunity to bring their music to Fredericksburg. Guitarist Rob Levit, leader of the FJF, has been described as "musical greatness" by Last Train Home vocalist and Washington Post writer Eric Brace. He is a five-time consecutive recipient of the Maryland State Arts Council Individual Artist Award and numerous other awards and grants. He is currently Artist-In-Residence at Maryland Hall for the Creative Arts. The FJF's debut CD has received national airplay and has been reviewed several prominent publications. Their unique brand of jazz, folk, poetic lyrics, and dynamic interplay makes for both an exciting yet intimate performance.